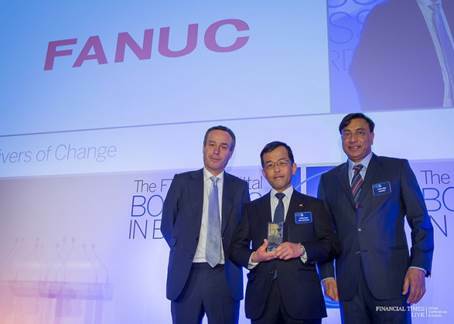 FANUC was presented with the “Drivers of Change Award” of the 2015 FT ArcelorMittal BOLDNESS IN BUSINESS AWARDS by the Financial Times and ArcelorMittal. The BOLDNESS IN BUSINESS AWARDS are granted to companies who stand out for their vision and leadership in exerting courage and imagination in taking calculated risks and making difficult decisions. Among the Awards, the “Drivers of Change Award” recognizes companies that are not afraid to change their company or even revolutionize their industry. 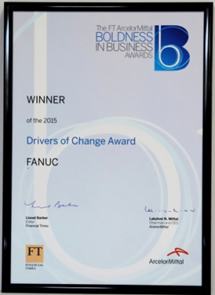 This was the 8th “Drivers of Change Award,” with previous winners being such companies as Apple and Amazon. At the awards ceremony which was held on March 17, 2016 at the Royal Institute of British Architects, a trophy and certificate were presented to Senior Executive Vice President Yoshihiro Gonda who attended on behalf of President & CEO, Dr. Yoshiharu Inaba. 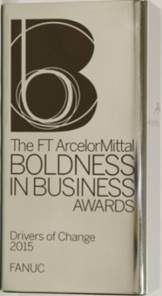 You can see the FT report on Boldness in Business and the videos and information on the Awards.